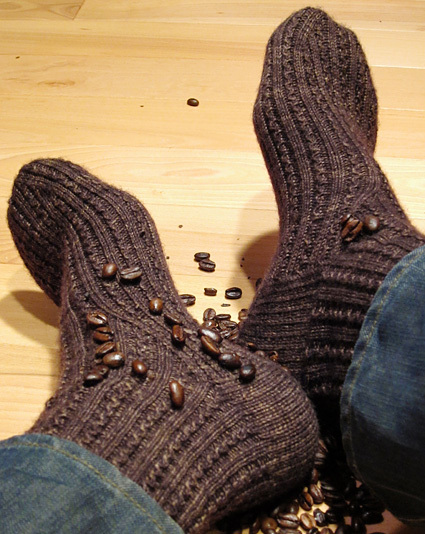 These socks are slightly caffeinated. Enough to keep you awake, but not enough to make you jittery, just like good java should. The tiny wiggles are fun to knit and the perfect opportunity to practice cabling without a cable needle- only two stitches in each cable and there are tons of them! My favorite part about these socks is the patterned gusset. After the stitches are picked up from the heel flap, the gusset stitches are worked in the rib pattern and the decreases consume the instep stitches instead of the gusset stitches. The ribs eventually merge and continue down the foot to the patterned toe. The toe is also different than normal; most of the decreases are made closer to the middle of the toe to allow the pattern on the side of the foot to continue to the last possible moment. Then the last stitches are decreased rapidly for a flat, graft-less toe. The pattern is extremely stretchy with a wide, round heel turn that is comfortable for a range of sizes. The larger size fits me, a women’s size 8, and my husband, a men’s size 11! C2B: Slip next st to cable needle and hold to back of work; k1, k1 from cable needle. Without a cable needle: Slip 1 with yarn in front, knit the next stitch. From the back, insert the left needle into the slipped stitch. Pull right needle free of both the knitted and slipped stitch. From the front, insert the right needle into the free knitted stitch. Knit the slipped stitch now on the left needle. C2F: Slip next st to cable needle and hold to front of work; k1, k1 from cable needle. Without a cable needle: Slip 1 with yarn in back, knit the next stitch. From the front, insert the left needle into the slipped stitch. Pull right needle free of both the knitted and slipped stitch. From the back, insert the right needle into the free knitted stitch. Knit the slipped stitch now on the left needle. 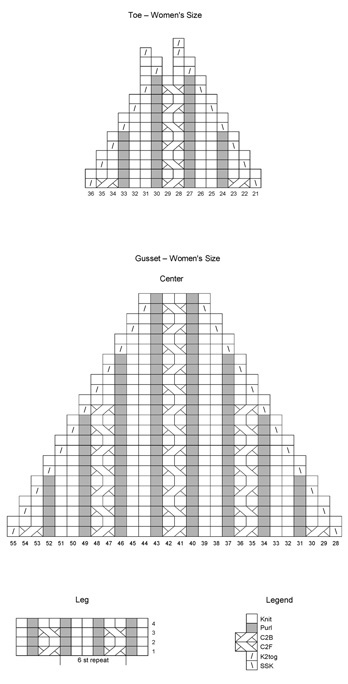 The charts for this pattern are very large, and have been divided into three parts. 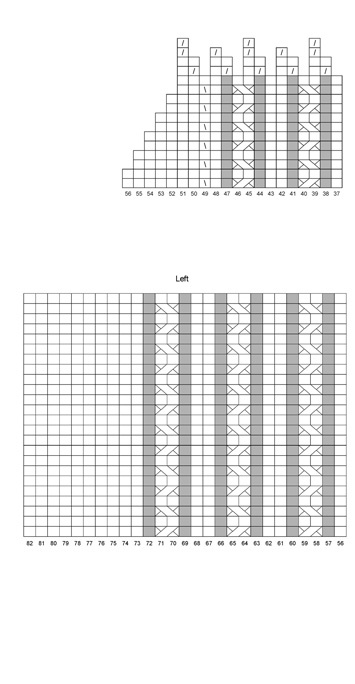 Click the appropriate size below and print each resulting page and assemble L-C-R.
Join in the round, being careful not to twist. Place marker for the beginning of the round. Ribbing round: K1, [p1, k2], rep to last 2 sts, p1, k1. Work Ribbing round for 1 inch. 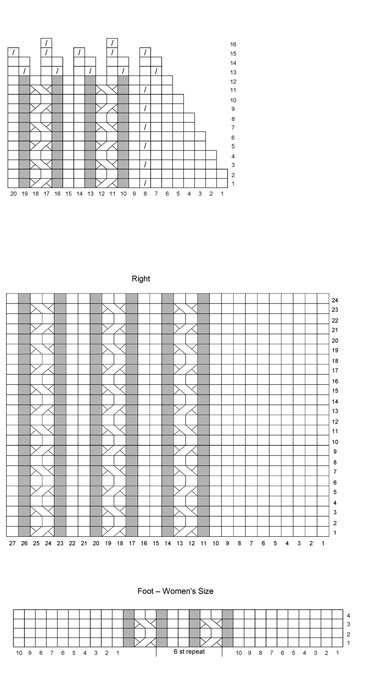 Use Chart or written instructions as you prefer. Round 1: K1, p1, [C2B, p1, k2, p1], rep to last 4 sts, C2B, p1, k1. Rounds 2 and 4: Work sts as presented (knit the knits and purl the purls). Round 3: K1, p1, [C2F, p1, k2, p1], rep to last 4 sts, C2F, p1, k1. Repeat Rounds 1-4 until leg is desired length, ending on Round 3. Shown 6.5 inches long. 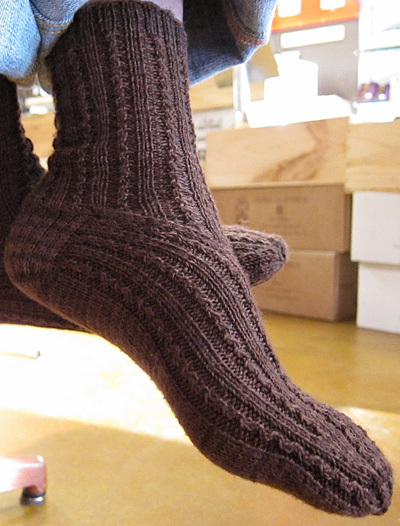 The heel flap will be worked back and forth over the last 30 sts of the sock. Turn so that WS is facing. Row 1 [WS]: Sl 1, p29, turn. These 30 stitches are the heel flap. Put other 30 stitches on a holder, scrap yarn, or spare needle if desired. Row 2 [RS]: [Sl 1, k1], rep to end, turn. 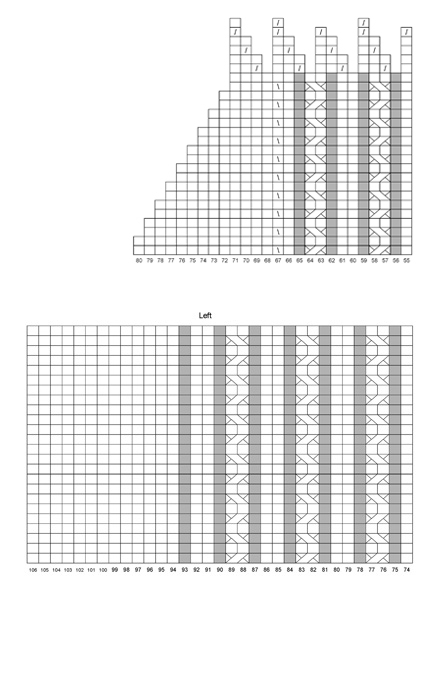 Repeat Rows 1-2 16 more times for a total of 34 rows, ending on a RS row. Row 1 [WS]: Sl 1, p16, p2tog, p1, turn. Row 4 [RS]: Sl 1, k7, ssk, k1, turn. Row 12 [RS]: Sl 1, k15, ssk, k1, do not turn. 18 sts remain. Row 1 [WS]: Sl 1, p23, p2tog, p1, turn. Row 2 [RS]: Sl 1, k7, ssk, k1, turn. Row 3 [WS]: Sl 1, p8, p2tog, p1, turn. Row 4 [RS]: Sl 1, k9, ssk, k1, turn. Row 5 [WS]: Sl 1, p10, p2tog, p1, turn. Row 6 [RS]: Sl 1, k11, ssk, k1, turn. Row 7 [WS]: Sl 1, p12, p2tog, p1, turn. Row 8 [RS]: Sl 1, k13, ssk, k1, turn. Row 9 [WS]: Sl 1, p14, p2tog, p1, turn. Row 10 [RS]: Sl 1, k15, ssk, k1, turn. Row 11 [WS]: Sl 1, p16, p2tog, p1, turn. Row 12 [RS]: Sl 1, k17, ssk, k1, turn. Row 13 [WS]: Sl 1, p18, p2tog, p1, turn. Row 14 [RS]: Sl 1, k19, ssk, k1, turn. Row 15 [WS]: Sl 1, p20, p2tog, p1, turn. Row 16 [RS]: Sl 1, k21, ssk, k1, turn. Row 17 [WS]: Sl 1, p22, p2tog, turn. Row 18 [RS]: Sl 1, k22, ssk, do not turn. 24 sts remain. 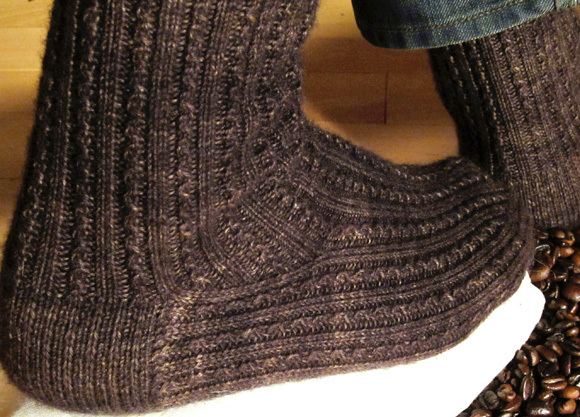 Pick up and knit 18 sts along the edge of the heel flap. Work across instep: K1, [p1, k2] 9 times, p1, k1. Pick up and knit 18 sts along the edge of the second heel flap, k9. Mark this as the beginning of the round. 84 sts total. Round 1: K10, p1, C2B, p1, [k2, p1, C2B, p1] x2, k1, ssk, [C2B, p1, k2, p1] x 4, C2B, k2tog, k1, [p1, C2B, p1, k2] x2, p1, C2B, p1, k10. 2 sts decreased, 82 sts. Round 2 and all even rounds: Work sts as presented (knit the knits and purl the purls). Round 3: K10, p1, C2F, p1, [k2, p1, C2F, p1] x2, k1, ssk, k1, p1, k1 [k1, p1, C2F, p1, k1] x3, k1, p1, k1, k2tog, k1, [p1, C2F, p1, k2] x2, p1, C2F, p1, k10. 2 sts decreased, 80 sts. Round 5: K10, p1, C2B, p1, [k2, p1, C2B, p1] x2, k1, ssk, p1, k1 [k1, p1, C2B, p1, k1] x3, k1, p1, k2tog, k1, [p1, C2B, p1, k2] x2, p1, C2B, p1, k10. 2 sts decreased, 78 sts. Round 7: K10, p1, C2F, p1, [k2, p1, C2F, p1] x2, k1, ssk, k1 [k1, p1, C2F, p1, k1] x3, k1, k2tog, k1, [p1, C2F, p1, k2] x2, p1, C2F, p1, k10. 2 sts decreased, 76 sts. Round 9: K10, p1, C2B, p1, [k2, p1, C2B, p1] x2, k1, ssk, [k1, p1, C2B, p1, k1] x3, k2tog, k1, [p1, C2B, p1, k2] x2, p1, C2B, p1, k10. 2 sts decreased, 74 sts. Round 11: K10, p1, C2F, p1, [k2, p1, C2F, p1] x2, k1, ssk, p1, [C2F, p1, k2, p1] x2, C2F, p1, k2tog, k1, [p1, C2F, p1, k2] x2, p1, C2F, p1, k10. 2 sts decreased, 72 sts. Round 13: K10, p1, C2B, p1, [k2, p1, C2B, p1] x2, k1, ssk, [C2B, p1, k2, p1] x2, C2B, k2tog, k1, [p1, C2B, p1, k2] x2, p1, C2B, p1, k10. 2 sts decreased, 70 sts. Round 15: K10, p1, C2F, p1, [k2, p1, C2F, p1] x2, k1, ssk, k1, p1, k2, p1, C2F, p1, k2, p1, k1, k2tog, k1, [p1, C2F, p1, k2] x2, p1, C2F, p1, k10. 2 sts decreased, 68 sts. 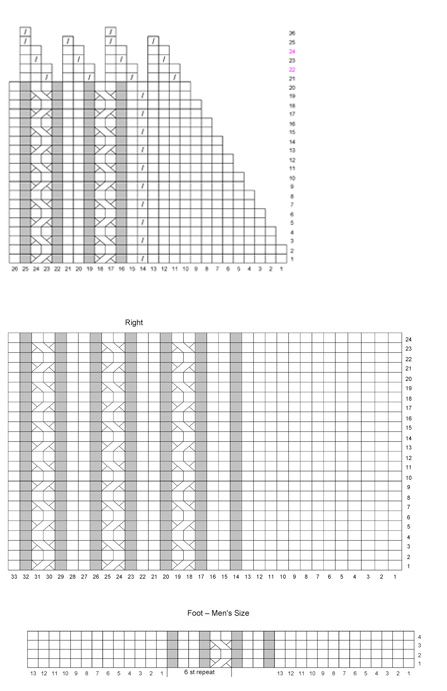 Round 17: K10, p1, C2B, p1, [k2, p1, C2B, p1] x2, k1, ssk, p1, k2, p1, C2B, p1, k2, p1, k2tog, k1, [p1, C2B, p1, k2] x2, p1, C2B, p1, k10. 2 sts decreased, 66 sts. Round 19: K10, p1, C2F, p1, [k2, p1, C2F, p1] x2, k1, ssk, k2, p1, C2F, p1, k2, k2tog, k1, [p1, C2F, p1, k2] x2, p1, C2F, p1, k10. 2 sts decreased, 64 sts. Round 21: K10, p1, C2B, p1, [k2, p1, C2B, p1] x2, k1, ssk, k1, p1, C2B, p1, k1, k2tog, k1, [p1, C2B, p1, k2] x2, p1, C2B, p1, k10. 2 sts decreased, 62 sts. Round 23: K10, p1, C2F, p1, [k2, p1, C2F, p1] x2, k1, ssk, p1, C2F, p1, k2tog, k1, [p1, C2F, p1, k2] x2, p1, C2F, p1, k10. 2 sts decreased, 60 sts. Round 24: Work sts as presented (knit the knits and purl the purls). Round 1: K13, [p1, k2, p1, C2B] x3, p1, k1, ssk, [C2B, p1, k2, p1] x6, C2B, k2tog, k1, p1, [C2B, p1, k2, p1] x3, k13. 2 sts decreased, 106 sts. Round 3: K13, [p1, k2, p1, C2F] x3, p1, k1, ssk, k1, p1, k1, [k1, p1, C2F, p1, k1] x5, k1, p1, k1, k2tog, k1, p1, [C2F, p1, k2, p1] x3, k13. 2 sts decreased, 104 sts. Round 5: K13, [p1, k2, p1, C2B] x3, p1, k1, ssk, p1, k1, [k1, p1, C2B, p1, k1] x5, k1, p1, k2tog, k1, p1, [C2B, p1, k2, p1] x3, k13. 2 sts decreased, 102 sts. Round 7: K13, [p1, k2, p1, C2F] x3, p1, k1, ssk, k1, [k1, p1, C2F, p1, k1] x5, k1, k2tog, k1, p1, [C2F, p1, k2, p1] x3, k13. 2 sts decreased, 100 sts. Round 9: K13, [p1, k2, p1, C2B] x3, p1, k1, ssk, [k1, p1, C2B, p1, k1] x5, k2tog, k1, p1, [C2B, p1, k2, p1] x3, k13. 2 sts decreased, 98 sts. Round 11: K13, [p1, k2, p1, C2F] x3, p1, k1, ssk, p1, [C2F, p1, k2, p1] x4, C2F, p1, k2tog, k1, p1, [C2F, p1, k2, p1] x3, k13. 2 sts decreased, 96 sts. Round 13: K13, [p1, k2, p1, C2B] x3, p1, k1, ssk, [C2B, p1, k2, p1] x4, C2B, k2tog, k1, p1, [C2B, p1, k2, p1] x3, k13. 2 sts decreased, 94 sts. Round 15: K13, [p1, k2, p1, C2F] x3, p1, k1, ssk, k1, p1, k1, [k1, p1, C2F, p1, k1] x3, k1, p1, k1, k2tog, k1, p1, [C2F, p1, k2, p1] x3, k13. 2 sts decreased, 92 sts. 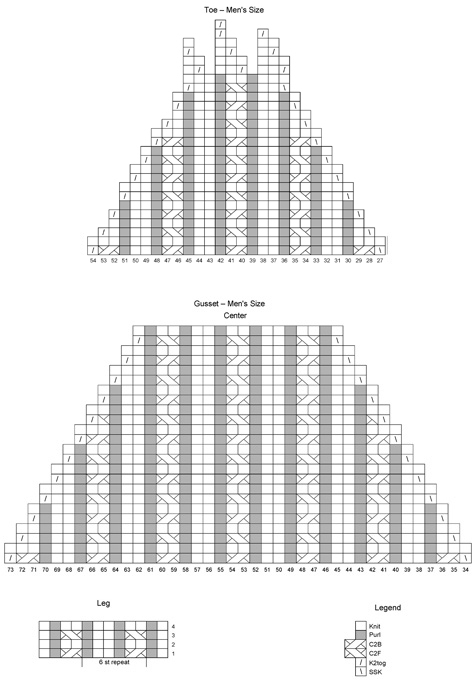 Round 17: K13, [p1, k2, p1, C2B] x3, p1, k1, ssk, p1, k1, [k1, p1, C2B, p1, k1] x3, k1, p1, k2tog, k1, p1, [C2B, p1, k2, p1] x3, k13. 2 sts decreased, 90 sts. Round 19: K13, [p1, k2, p1, C2F] x3, p1, k1, ssk, k1, [k1, p1, C2F, p1, k1] x3, k1, k2tog, k1, p1, [C2F, p1, k2, p1] x3, k13. 2 sts decreased, 88 sts. Round 21: K13, [p1, k2, p1, C2B] x3, p1, k1, ssk, [k1, p1, C2B, p1, k1] x3, k2tog, k1, p1, [C2B, p1, k2, p1] x3, k13. 2 sts decreased, 86 sts. Round 23: K13, [p1, k2, p1, C2F] x3, p1, k1, ssk, p1, [C2F, p1, k2, p1] twice, C2F, p1, k2tog, k1, p1, [C2F, p1, k2, p1] x3, k13. 2 sts decreased, 84 sts. Round 1: K10, p1, [C2B, p1, k2, p1] to last 13 sts, C2B, p1, k10. Round 3: K10, p1, [C2F, p1, k2, p1] to last 13 sts, C2F, p1, k10. Repeat Rounds 1-4 until foot is 1.5 inches shorter than full length of foot, ending on Round 4. Round 1: K13, p1, k2, p1, [C2B, p1, k2, p1], rep to last 13 sts, k13. Round 3: K13, p1, k2, p1, [C2F, p1, k2, p1], rep to last 13 sts, k13. Repeat Rounds 1-4 until foot is 2 inches shorter than full length of foot, ending on Round 4. Round 1: K7, k2tog, [k1, p1, C2B, p1, k1] twice, ssk, [C2B, p1, k2, p1] 2 times, C2B, k2tog, [k1, p1, C2B, p1, k1] twice, ssk, k7. 4 sts decreased, 56 sts. Round 3: K6, k2tog, [k1, p1, C2F, p1, k1] twice, ssk, k1, p1, k1, [k1, p1, C2F, p1, k1] 1 times, k1, p1, k1, k2tog, [k1, p1, C2F, p1, k1] twice, ssk, k6. 4 sts decreased, 52 sts. Round 5: K5, k2tog, [k1, p1, C2B, p1, k1] x2, ssk, p1, k2, p1, C2B, p1, k2, p1, k2tog, [k1, p1, C2B, p1, k1] x 2, ssk, k5. 4 sts decreased, 48 sts. Round 6 and all even rounds: Work sts as presented (knit the knits and purl the purls). Round 7: K4, k2tog, [k1, p1, C2F, p1, k1] x2, ssk, k2, p1, C2F, p1, k2, k2tog, [k1, p1, C2F, p1, k1] x 2, ssk, k4. 4 sts decreased, 44 sts. Round 9: K3, k2tog, [k1, p1, C2B, p1, k1] x2, ssk, k1, p1, C2F, p1, k1, k2tog, [k1, p1, C2B, p1, k1] x 2, ssk, k3. 4 sts decreased, 40 sts. Round 11: K2, k2tog, [k1, p1, C2F, p1, k1] x2, ssk, p1, C2F, p1, k2tog, [k1, p1, C2F, p1, k1] x 2, ssk, k2. 4 sts decreased, 36 sts. Round 13: [K2tog, k1] rep to end. 12 sts decreased, 24 sts. Round 15: [K2tog] rep to end. 12 sts decreased, 12 sts. Round 16: [K2tog] rep to end. 6 sts decreased, 6 sts. Cut yarn, leaving a 6 inch tail. Run tail through remaining sts and pull tight. Round 5: K11, k2tog, [k1, p1, C2B, p1, k1] twice, ssk, p1, k1, [k1, p1, C2B, p1, k1] x3, k1, p1, k2tog, [k1, p1, C2B, p1, k1] twice, ssk, k11. 4 sts decreased, 72 sts. Round 7: K10, k2tog, [k1, p1, C2F, p1, k1] twice, ssk, k1, [k1, p1, C2F, p1, k1] x3, k1, k2tog, [k1, p1, C2F, p1, k1] twice, ssk, k10. 4 sts decreased, 68 sts. Round 9: K9, k2tog, [k1, p1, C2B, p1, k1] twice, ssk, [k1, p1, C2B, p1, k1] x3, k2tog, [k1, p1, C2B, p1, k1] twice, ssk, k9. 4 sts decreased, 64 sts. Round 11: K8, k2tog, [k1, p1, C2F, p1, k1] twice, ssk, p1, [C2F, p1, k2, p1] twice, C2F, p1, k2tog, [k1, p1, C2B, p1, k1] twice, ssk, k8. 4 sts decreased, 60 sts. Round 13: K7, k2tog, [k1, p1, C2B, p1, k1] twice, ssk, [C2B, p1, k2, p1] twice, C2B, k2tog, [k1, p1, C2B, p1, k1] twice, ssk, k7. 4 sts decreased, 56 sts. Round 15: K6, k2tog, [k1, p1, C2F, p1, k1] twice, ssk, k1, p1, k2, p1, C2F, p1, k2, p1, k1, k2tog, [k1, p1, C2B, p1, k1] twice, ssk, k6. 4 sts decreased, 52 sts. Round 17: K5, k2tog, [k1, p1, C2B, p1, k1] twice, ssk, p1, k2, p1, C2B, p1, k2, p1, k2tog, [k1, p1, C2B, p1, k1] twice, ssk, k5. 4 sts decreased, 48 sts. Round 19: K4, k2tog, [k1, p1, C2F, p1, k1] twice, ssk, k2, p1, C2F, p1, k2, k2tog, [k1, p1, C2B, p1, k1] twice, ssk, k4. 4 sts decreased, 44 sts. Round 21: [K2tog, k2] rep to end. 11 sts decreased, 33 sts. Round 23: [K2tog, k1] rep to end. 11 sts decreased, 22 sts. Round 25: [K2tog] rep to end. 11 sts decreased, 11 sts. Round 26: [K2tog] rep to last st, k1. 5 sts decreased, 6 sts. Cailyn lives near Seattle, WA with her husband and two cats, where her strange obsession with designing socks takes up most of her time. 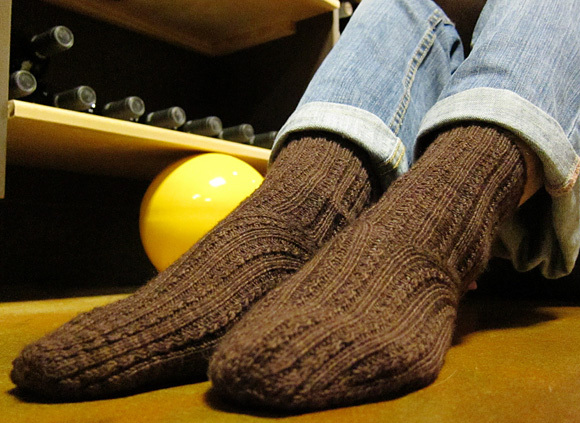 She writes about her socks and other crafty tribulations on her blog.